This is a story from the Samish people of the Pacific Northwest. Up near the border with Canada, the Pacific Ocean divides the Olympic Peninsula from the rest of Washington State. That arm of the Pacific Ocean is called Puget Sound, a deep glacial fjord. This is where the Samish people have lived for many, many years. But the water of Puget Sound is much more than just part of the Pacific. You see, the rivers on the Olympic Mountains, on the Olympic Peninsula, flow into Puget Sound from the west, and the rivers on the Cascade Mountains, on the mainland of Washington State, flow into Puget Sound from the east. These three waters are mixed together by the tides, forming an enormous estuarial home for The Samish as well as many plants and animals. Puget Sound is vast. If you took a boat out onto Puget Sound, there are some places where the only land you could see are the mountain tops in the distance. But in other places, rugged windswept islands are clustered together, covered with pine trees, some islands with sheer cliffs dropping into the water, others with sandy beaches. About half way between Seattle and the Canadian border, there are two islands that are very close together. There is only a narrow channel between them, where the brilliant dark green tide waters rush in and out, and where large whirlpools swirl around, with long stands of kelp caught in them. The Samish people have a story about that narrow channel and a sandy beach near by. Their story is called "The Woman Who Married the Sea." Once there was a young woman who loved to swim in the narrow channel. She had studied the tides and the whirlpools very carefully from the shore, so she knew exactly where to swim. She loved the feel of the rushing water against her body and her dark hair floating behind her. The sea saw her swimming and fell in love with her. Every day, the young men of the tribe went to sea in their canoes to catch salmon while the young women gathered clams and mussels and crabs on the beaches. One day, the young woman was gathering shellfish on a sandy beach near the channel. When she found a spurting clam hole, she dug up the clam and bent to pick it up. But the clam escaped from her hand. "You are the most beautiful woman who has every lived. Thank you for coming to visit me." The watery hand held onto hers for several moments longer, then let go. She slowly backed out of the water, completely forgetting that jumping clam. Then she walked home, often looking at her hand. The next day when she was gathering clams again, she was not surprised when a clam led her into the water again. Nor was she surprised when the watery hand clasped hers again and the deep, beautiful voice spoke again. "Thank you for coming back to visit me. Let me tell you about my world." "Yes, yes, oh please do," she eagerly replied. "You have seen parts of my world, but only small parts of it, living where you do. You have seen glimpses of the whales and porpoises, the seals and the sea birds, and of course, the salmon. By the shore, you’ve seen the shellfish, the barnacles and starfish and herring, and in the tidal pools, the sea anemones, the sea cucumbers and the snails." "Yes, yes, I have seen them." "But you have never seen the giant octopus which lives in the deep water, nor the wolf eels that hide in the rocks. You have seen the kelp along the beaches. But have you ever seen a kelp forest?" "A kelp forest? What is that?" she asked, fascinated. "The kelp starts growing down on the rocky bottom. Then it grows up and up and up. When it gets to the surface of the water, it branches out, floating on the surface of the water to form a dense canopy, like your trees branch out as they reach for the sky. But your trees are so rigid – they barely move in the wind. Kelp forests dance and sway and ripple with every tiny movement of the water. The smallest creatures nestle in and amongst the kelp and the rocky bottom, hiding, while the larger creatures swim by and eat them. The kelp forest nourishes and protects its animals at every level of the water. " "Oh, that sounds wonderful," she said, with longing in her voice. "Tell me more." "Just as your forest changes with the seasons, so does the kelp forest. In the winter, the waves rip the kelp from their rocks and throw them onto the beaches, leaving gaps in the forest. But in the spring, new plants unfurl, filling the gaps, sometimes growing as long as your lower leg each day, until a new canopy floats on the surface. The sun filters down through the kelp canopy and glistens over everything it touches." "Your world is truly marvelous." So they spoke more that day. "Will you come live with me in my world? Will you marry me?" "Yes, yes, I will, if my father gives permission." So out of the water came a young man, a handsome young man, the sea itself in the form of a human. And the two young people walked to the village to speak to her father. "No! NO! My daughter will never marry the sea!" the father burst out. "She will die in the sea!" And he thought, "If she leaves my world, my heart will shatter." "NO! NO! My daughter will never marry you." "Then your people will die," the young man replied calmly. "I will no longer feed them." The young man turned and walked back to the sea. The next day, when the young men of the tribe went out in their canoes, they could find no salmon. The young women on the shore could find no shellfish. So the tribe got in their canoes and went to the mainland, following a river inland, hoping to find some freshwater fish. But they did not. And as the days went on, even the water in the rivers dried up. The people had nothing to drink. So the young woman went to her father. "Father, you must let me marry the sea. I want to live in the sea. The people will die if I don’t marry the sea." "No, you will never marry the sea," he replied again. Then she went to the sea. "Please, please feed my people. We are dying." "Not until you marry me." And so for a second day and then a third day, the young woman went back and forth between her father and the sea. But they both held fast to their decisions. But on the fourth day, when she went to her father, she said, "Father, you and I will die soon. Please, let me live with the sea. I will be happy there." "You are right," the father reluctantly agreed. "Go get the young man. I must speak to him." And so she went all the way back to the sea, and the sea once again took the form of a young man. The two young people walked back to her father. "I will let you marry my daughter only if you agree to two promises. First, my daughter must be happy with you." "I will gladly see to that." "And my daughter must come back one day each year, so that I can see that she is happy." Thus the two young people were married. Then those of the tribe who still had some strength walked with them back to the shore. The sun was just setting. First the young man walked into the water and disappeared. Then the young woman followed. For a few moments, her long dark hair floated on the sunset-painted water. And then that too disappeared. The next day, the river was full of water, and the sea was full of salmon and shellfish. The people would live. Every day there was an abundance of water and food. But on the day before the return of the woman who married the sea, the catch of salmon was greater than the had ever seen. And the clams almost jumped out of their holes. That first time when the young woman returned, she was more beautiful than ever. Her happiness shone out of her eyes and smile. But during her second visit and her third, the people began to notice she was having a hard time breathing and walking on the land. On the fourth visit, every step was a struggle and she gasped for every breath. So the people held a council. And even her father agreed. "She will die if she comes back again, even just one more time. We must release her from the promise." So the council told her she did not have to come back again. She said good bye to her father, for the very last time. And slowly she walked into the sea. No one ever saw her again. But her spirit was always with them, and the people continued to have plentiful catches and fresh water to drink. They say that when the young men take their canoes through that narrow channel, if they think of her, their canoes go swiftly through, always avoiding the whirlpools. They say sometimes that they see her long dark hair floating on the surface of the water. Generation after generation, mothers have told their children this story, the story of our mother, the story of the woman who feeds us all, the story of the woman who married the sea. The Samish people continue to tell this story to this day. 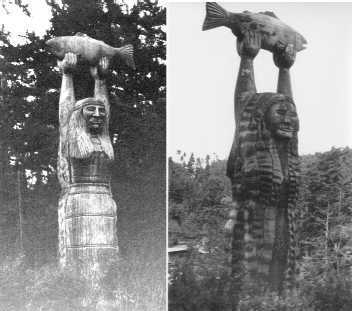 In 1983, on Rosario Beach where the young woman gathered her clams and shellfish, they erected a 23’ red cedar pole that is carved on two sides. On the side facing the land is the young woman with her long hair and her dress, holding aloft a salmon. But on the side that faces the sea, her dress is covered with clams and mussels and starfish. Her hair is made of kelp, with the smallest sea creatures hiding in its strands. And she too holds aloft a salmon. I would like to thank my friends Nola and Shannah for their first hand descriptions of Puget Sound, as well as storyteller Victoria Beatty for her descriptions and information about kelp forests. I would also like to thank Roy Oram for the Pender Island story pole web site. But most of all, I want to thank Barry McWilliams, aka Eldrberry http://www.eldrbarry.net/ who wrote me a long letter, listing two of the web sites below, and sent many photographs of the story pole and Rosario Beach, including the two above. Susan Hazen-Hammond, "The Woman Who Married the Sea", Spider Woman’s Web: Traditional Native American Tales About Women’s Power, 1999, p. 207-209. Lloyd J. Averill and Daphne K. Morris, Northwest Coast Native and Native Style Art, 1995, p. 135-7.
http://www.normboynton.com/dcptnp3.htm Photographs of the story pole and Rosario Beach. http://www.penderislands.org/pages/bearmother.html Description and photographs of how other story poles were created on Pender Island, just north of Puget Sound. Earl Emerson, Deception Pass: A Thomas Black Mystery, 1997. A novel set near Rosario Beach. http://www.mbayaq.org/efc/efc_hp/hp_kelp.asp Kelp forest information and photographs.